Furniture Facts, Ideas, Opinions, & Comments | Check back often to learn more fun and interesting stuff about furniture. Check back often to learn more fun and interesting stuff about furniture. With spring around the corner, you may already be dreaming of pulling out your lawn mower, getting in the garden and arranging your patio furniture to relax outside. Whether you stored your furniture in the garage or it weathered the elements out on the deck, here are some tips to spruce up your furniture to keep your patio and porch looking as fresh as spring. Over the course of the fall and even the winter, some patio furniture can become loose. From a season of use or maybe from the strain of snow and other elements, the furniture could be a little wore down. Whatever the circumstances, it is important to inspect their patio furniture and tighten nuts, bolts and screws. This ensures that nothing will fall apart. If the patio furniture has cushions, chances are they have suffered damage since the last time they were used. If it rained or snowed mold and mildew may have grown on the cushions and this is something that should not be left alone. It may be possible to take the cushions and wash them; however, if this is not something that can be done the cushions should be replaced. If you properly stored your cushions, they may still benefit from a wash. Using a foam type cleaner or simply warm, soapy water to spot treat. Once the cushions are clean, check them over for any rips or tears that can be sewn or consider re-stuffing them if they’ve fallen flat and uncomfortable. Some patio furniture is susceptible to rust. Because of this, it is important to clean off the rust when the time comes for spring to prevent further damage. Do this by using sandpaper and rubbing the rust off. When rust has been sanded, apply a spray sealer and coat the furniture to prevents rust from developing in the future. Their furniture can look fresh and clean all the time. Tables and chairs can sometimes hold residue from nature while they are unattended. There may be insect residue on a table, or dirty leaves may have left some impressions on a chair. To save money and the need to replace them, clean them as best you can. Using soap and water (add bleach for light furniture), wipe down the dirt and grime to make the furniture look new again. What are your favorite quick tips for sprucing up your furniture? When it comes to making furniture, having patience will ensure perfection. If you’ve wanted some new furniture, it would be a great idea to learn how to make it yourself. Making your own furniture can be such a great experience. At the end of the day, you’ll be proud of your hard work, and you’ll appreciate the furniture you’ve made even more than you would appreciate something you bought. You would be very proud to tell people that you made the furniture in your house. Saving money is always a great option, and making your own furniture can certainly help you do that, as well. The benefits to making your own furniture are endless, and you can start now using some of the information below. The first and most important thing to keep in mind when you make the decision to build your own furniture is to be confident. What often happens is people think they want to make their own furniture, and then they start doing it and quit. If you start making something, you may as well finish it. The things you build can become symbolic in your life. Think about Henry David Thoreau’s cabin that he built at Walden Pond? A lot of the joy he got from the cabin wasn’t from the cabin itself, but in the making of it, he learned a lot about himself. You can learn how much of a confident, self-assured person you are by making your own furniture. If you lack confidence in yourself, you’ll never be able to plunge into a new project and successfully complete it. Jump right in and do your best. Once you have the right frame of mind to start a furniture-making project, you have to get the right materials. It’s much better to go to a place where you know you’ll have help. I would suggest going to Home Depot to get most of the things you need. The people there are beyond friendly, and you’ll get the top-quality materials at the best prices. They may even give you their own suggestions for your project. Make sure to have an exhaustive list of anything you could possibly need for your project. It will be a lot easier in the long run to have an organized list and to check each thing off as you buy it. Once you’ve gotten mentally prepared and you’ve purchased the materials, it’s time to build. One of the biggest pieces of advice I can give any beginning builder is to take your time. It’s much better to get a good job done slowly than to try to go quickly and mess things up. Give yourself a certain amount of time every so many days. Whatever you get done within that time is what you get done. Don’t rush to do more. If you don’t know what you’re doing, you could end up ruining the entire project with mistakes. Make sure you follow the instructions exactly as they have been given to you. There’s no telling just how great of an experience building your own furniture will be for you until you try it. As a precursor to the article, I just want to add that I absolutely love a simplistic rocking chair and the whole idea of sitting on the porch, rocking away to the passersby. Depending on your skill level, you’ll want to choose a style that you feel comfortable with. If you’re an expert woodworker more intricate designs might be a breeze, but if you’re a novice you might want to try something more basic. Once you know what kind of design you’d like to build, you’ll have to decide whether you’re going to draw your own plans or obtain pre-planned blueprint. Again, your skills come into play. If you’re a seasoned carpenter making your own plans may not be too intimidating, but for those less skilled it could be a daunting task. If you do decide to go with an original design, keep in mind that the more arc the rocker feet have, the more extreme the forward and backward motion. Chairs with intense arcs can dump small children off onto the floor or leave holes in the walls behind them. Having a design with slightly arced feet is most beneficial in placement and function. You can use almost any wood for this type of project, but if you want the piece to last choosing a sturdy hardwood is best. Cherry, maple, alder, oak, walnut, or mahogany work great and withstand the test of time. Your wood choice also affects the selected finish. If you’re looking to stain the piece a dark color, steer clear of maple and oak. Maple tends to turn blotchy and oak leaves golden highlights that produce a less uniform finish. Rocking chairs were built long before power tools existed, so they aren’t required, but they do make the job a lot easier. Here are some basic tools you’ll need. Once you have all the pieces cut, put them together beginning with the legs and seat, working your way toward the back, and finally to the rocker feet. Attach all pieces using both wood glue and either screws or finish nails. Make sure the metal fasteners are sunk into the wood far enough that you can use wood putty to fill the hole and create a seamless finish. Make sure each piece fits tightly together and that you rub the end of any spindles with talcum power before inserting in their countersunk holes. If you’ve used bolts, make sure they are tight and that any metal flex joints are oiled. If squeaking continues it may just be that the floor underneath the chair is not level, try moving it to a different location. Kids and adults of all ages enjoy the soothing movement of rocking chairs and building one of your own can be a quite a fulfilling accomplishment. There is no better way to bring comfort to the future generations that will continue beyond your lifetime. When the summer temperatures start winding down to fall, don’t expect fall design trends for your home to cool down at all. Despite the economic times looking cold, upcoming fall design trends are looking warm! Creating a festive autumn décor is your home is a cinche…whether you run to the store to decorate or you try some easy DYI projects, your house will be ready for fall. Try these ideas to get your house looking wonderfully festive. High Glamour: There is no reason for your home to look like its feeling an economic pinch or to look to hokey with fall decorations! Using rich materials, classy colors and striking curves and shape, whether it’s in furniture or décor, your house will be looking luxurious. Warm tones: Bring in some familiar warm tones, like reds and oranges, to help make your space resonate with the season and feel cozy. Bring in some bronze and copper hues; it is a unique way to bring in the fall colors with an elegant twist. If you don’t want such a bold statement, accessorize a neutral color palette with pillows and blankets and décor in fall colors. Don’t forget that fall is wine season, so deep purple and greens are also great colors to mix in to your decorations. Outdoors Matter Too: Make the entrance to your house festive for the season and welcoming with some autumn inspired decorations (think scarecrows and pumpkins). Plant mums and even sunflowers to bring color to your porch. Adding different size and color pumpkins and gourds is also a creative way to add color and interest to your front porch. Indoor Décor: The pumpkins and plants aren’t only for your doorway, bring them inside too. Use mini pumpkins and gourds and plants to create center pieces for your dining or coffee table. Using these natural materials will add textures and unexpected interest on your tabletops. Easy DYI Décor: Just as you update your wardrobe, you can update your home as well. A scarf can be used as a pretty and easy table top runner. Or make a festive autumn branch tree for a center piece or side table decoration (see easy DYI decorations here : http://www.marthastewart.com/267415/autumn-branch-centerpiece). Share any other fall decorating tips you use to keep your house looking brilliant here! It used to be that out-door living spaces were only conducive to sunny California, and weather permitting homes. However, a recent trend is on the rise, and back yards are being used more as “bonus room” than a place to play catch or have the dog run around. 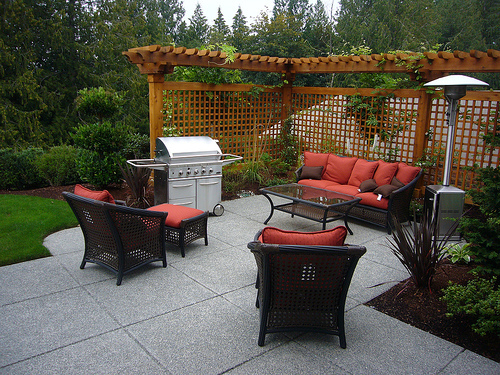 Perfectly landscaped back yards, and expensive furniture can be a lot of work. Whether you are maintaining the lawns yourself or paying to have it done, it is quite an undertaking. You also have to worry about the weather, when it rains you have to run home and bring all the cushions, and tables inside before they are destroyed by the rain. There are however, plenty of benefits to having a space like this. When you are having a backyard BBQ, or simply a quiet night with a glass of wine, they can be quite the relaxation room that you may be looking for. If you can afford it space wise, there are ways of getting around the pricey costs of weather permitting furniture and creating a little oasis for those hot summer nights. Even if you don’t have the biggest yard to work with, you can still create a space for a little “me” time. Try using bricks to separate a space and start out with a chair and some comfy but bright colored pillows. Over time you can build up the spaces adding a table, and a couch, etc. The trick is to make it look as comfortable as can be. Another benefit to a back yard living space is having a cool place to go after a hot day. If you don’t have air conditioning then you must enjoy being outside, because on those extremely hot days you won’t want to be stuck in a stuffy house. Use your space as a place to cool off and enjoy the nice weather (hopefully) the summer has to offer. Brunch, one of my favourite meals, is a combination of the words “breakfast” and “lunch”. This meal/activity, which typically takes place around 10 or 11 am, may consist of anything from cereal to steak, the choice is yours! Why not call up some friends, decide on a menu, pull out your nice dishes, gather your bread cutting boards and enjoy some great food in the company of friends and family this weekend? The beauty of brunch is that you can make it the meal you want, there are no rules. Personally, I prefer the breakfast version of brunch with lots of substance, not to mention calories! My brunches include such things as cooked ham, bacon, sausages, scrambled eggs, French toast, croissants, Vermont maple syrup, sliced baguette, country cheeses, fresh fruit and lots of coffee. If you are feeling festive, or celebrating a special occasion, mimosas, a combination of bubbly wine and orange juice, are a fun addition to the menu. Make the dining room the center of the party. A colourful table cloth, some vibrant casserole dishes to keep the eggs, bacon and French toast warm, a maple baguette cutting board for the French bread, an antique plate for the sliced ham and sausages and a whimsical pig cutting board for the cheeses. You can add some fresh flowers to the mix as long they are in low vases so as to not get knocked over as people serve and pass the food. Don’t forget to protect your antique table from hot plates and casseroles by placing items on trivets or smaller round cutting boards. The flexibility and versatility of brunch make it a fun and simple way to entertain. You can make it as simple, a basket of warm croissants and a cutting board with a choice of cheeses on it, or as elaborate, ready to serve eggs, ham and home fries along with a variety of loaves on an assortment of cutting boards for bread, your decision. 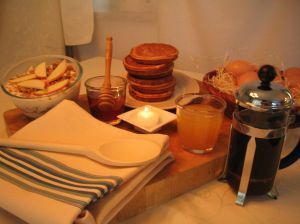 Before your next brunch, be sure to visit Cutting Board USA, our solid maple or walnut baguette board is a perfect fit. Its long and narrow shape make it ideal for slicing and serving baguettes and loaves of bread, as well as serving cheeses, directly on the table. Cutting Board USA manufactures quality wood cutting boards in Vermont, USA. With the snow setting in and the cold temperatures making a much more permanent stay, we find ourselves cranking the heat up in order to stay cozy until spring rolls around. Owners of older homes find themselves at a serious disadvantage when heating their homes because they likely do not have proper insulation. Although the heat gets turned up, a lot of it is lost through cracks in the walls or through the floors, ceilings and/or windows (especially true for older windows that do not have a very good thermal coefficient). Tax rebates entice a lot of people to put in new windows and to insulate their homes thus promoting energy efficiency. However, there is definitely a right and wrong way to do it. When installing insulation in attics, be sure to install baffles along the ceiling in order to allow air to flow between the insulation and roof. That will inhibit moisture from forming. Additionally, use insulation with a higher R rating to increase the amount of energy saved. R-30 is generally standard for a lot of applications, but in severely cold climates, r-45 provides even better thermal protection, especially in areas where the house may have cracks or vents allowing cold air to pass. If you apply two R-19’s on top of each other, the result is an thermal insulation ratings of R-38 and so on and so forth. Insulation should not be smashed down. It should fit comfortably within joists or between studs to provide the maximum thermal benefit. 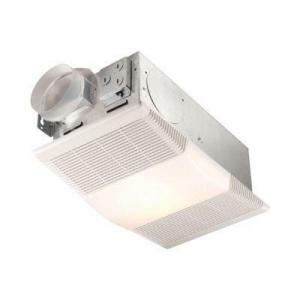 Aside from insulating, a lot of people go a step further and install either wall or ceiling mount heaters and fan units, especially in the bathroom to take the chill out of the room throughout their early morning shower. When upgrading to an electric ceiling mount fan unit in a bathroom there is a very common mistake that is made that can easily be avoided during the installation process, ultimately saving you a lot of headaches. It involves the installation of uninsulated (standard) flexible ducting that allows the air in the bathroom to exit the house. (Pictured below). The standard ducting is relatively cheap but ultimately poses a problem for bathrooms that get steamy. It is more of a problem when the ducting runs through a location where cold air is prominent (attics).In bathrooms that add the heater unit, the higher temperature only furthers the problem. When the steam exits the bathroom and enters the duct, the difference in temperature between the inside of the duct and the air in the attic causes condensation to form. The condensation then leaks onto your ceiling and ruins the drywall likely resulting in added repair costs. This problem can easily be avoided. 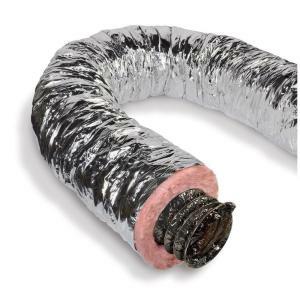 When adding an exhaust fan (especially one with an optional heater unit) insulated ducting should be implemented to inhibit condensation from forming. 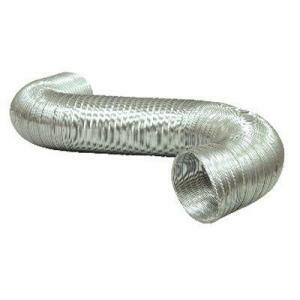 Insulated ducting is still relatively cheap and will provide a crucial benefit to your bathroom remodeling project. That way you can truly relax in your cozy bathroom with the piece of mind that your install was done properly. Building Your Own, Ahhhhh, Rocking Chair! Hand-Painted Refrigerator Magnets, Ornaments, Metal Ceilings, Accessories.